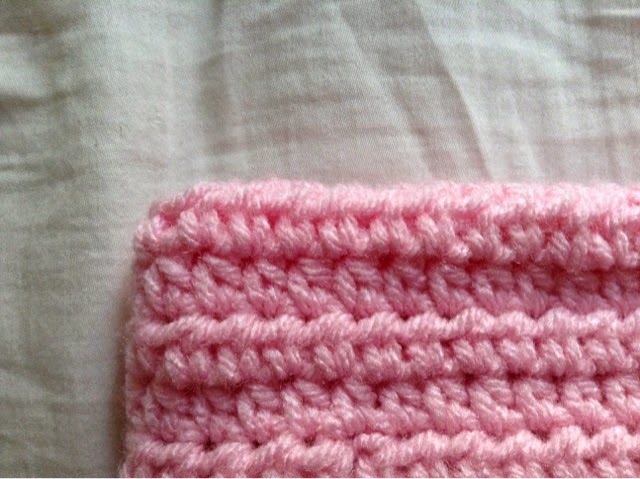 Since I received my iPod Touch, I have crocheted some accessories for it. This is a case I made to carry my iPod, earbuds, and the iPod Loop whenever I am traveling with my family. I also made a cozy that fits over the iPod with your protective case on it. Today, I will be sharing the case pattern. Row 1: With light pink yarn, ch 32, hdc in 3rd ch from hook, 1 hdc in each ch across, turn. Rows 2-19: Ch 2, 1 hdc in each st across, turn. Fasten off at the end of row 19. Using tail ends, sew long edges of piece together. As shown in this picture, sew the top edges together. 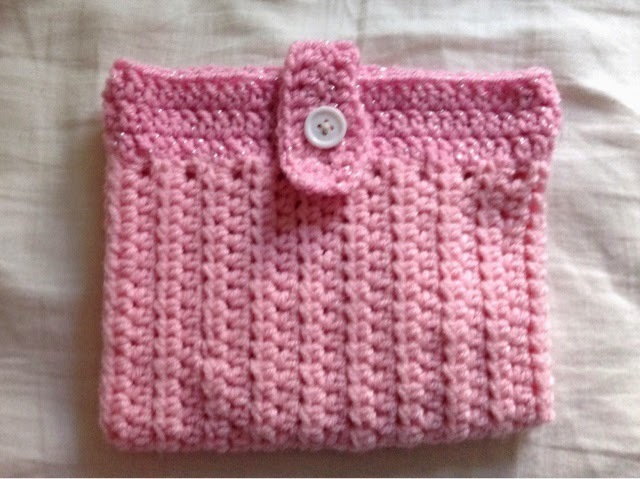 Join pink sparkle yarn at top of bag body. Rnds 1-3: Ch 3, 40 dc evenly spaced around top. Join to 1st st of rnd. Fasten off at end of rnd 3. Row 1: Ch 15, dc in 4th st from hook, 1 dc in each ch across, turn. Row 2: Ch 3, 1 dc in each st across, turn. Fasten off. Sew to back inside of back top of bag. Sew a button to the front of bag. Row 1: Ch 16, hdc in 3rd ch from hook, 1 hdc in each ch across, turn. Rows 2-12: Ch 2, 1 hdc in each st across, turn. Fasten of at end of last row. Sew onto the inside of case. Very cute little cover! While I don't have an ipod/ipad/tablet, I do think this would make a lovely laptop case if modified. Thanks so much for sharing at our Yarn Fanatic Linky Party, and I hope you will be by to party with us again real soon! Hello! I really appreciate you sharing at our Yarn Fanatic Party! Since our current party is a long one, I decided to put together a collection to share. This is my first round up, and includes Purses, Bags and Cases shared out our previous Yarn Fanatic Parties. Thank you for your support, and for being a part! You can find it here: http://eyeloveknots.blogspot.com/2015/08/20-yarn-tastic-purses-bags-cases-yarn.html.